Posted on January 9, 2019 at 5:27 am. We begin today with WOLF PACK PRIDE! There are a lot of AMAZING students here at WMS. And you deserve to be recognized! 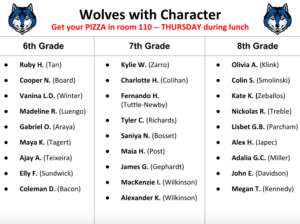 Teachers from every grade and every team have identified a distinguished group of students to receive this month’s Wolves With Character Award — for demonstrating outstanding “CARING” in their daily lives. Just take a look at the screen to see all the deserving honorees from the 6th, 7th, and 8th grades. Congratulations, wolves with character!! [clap]. Be sure to stop by room 110 during your grade-level lunch on THURSDAY — you’ve earned yourself some free pizza! Take the shot!! Today is the LAST DAY of tryouts for the WMS Girls Basketball team. Student Athletes are reminded to check the activity board by the cafeteria to see if you’ve been “called back” for the FINAL round. Also, make sure your physical is on file with Ms. Hogwood. See Coach Sutphin with any questions or for more information. The WMS Jazz Band Club will be hosting its next “Jam Session” on THURSDAY during ASP 1 in the Band Hall. All instruments are welcome! For more information, go to the Jazz Club page on the WMS website or contact the band leader, Mr. Wilkin. You’ll have a swingin’ good time! And now for an update on the upcoming WMS Spring Musical — Alice in Wonderland, Jr. A “read through” for the TECHNICAL CREW ONLY is scheduled for this THURSDAY during ASP 1 and 2 in the backstage area. Anyone interested in working back stage should attend this important planning meeting. As for the performers, the cast list will be posted later this week. The first ON STAGE rehearsal will be held next MONDAY after school in the auditorium. See Mr. Brown for more information — and break a leg! And finally today, it’s a brand new year — and a brand new YOU! Student-reporters Liam O. and John E. want to know what you resolve to do in 2019.